Dessert lovers will soon be able to indulge in a new range of spirits-infused Häagen-Dazs ice creams, including a dairy-free amaretto flavour. The “rich and creamy” Häagen-Dazs Spirits Collection features five new ice cream flavours, a dairy-free frozen dessert and a cookie square. The range includes: Irish Cream Brownie, white rum-infused Rum Tres Leches, Bourbon Vanilla Bean Truffle, Stout Chocolate Pretzel Crunch, Bourbon Praline Pecan and non-dairy Amaretto Black Cherry Almond Toffee frozen dessert. The series also includes Irish Cream Cookie Squares, a chocolate cookie topped with Irish cream-infused ice cream and dipped in dark chocolate. “The Häagen-Dazs brand is built on a passion for transforming the finest ingredients into extraordinary ice cream experiences,” said Rachel Jaiven, Häagen-Dazs brand manager. 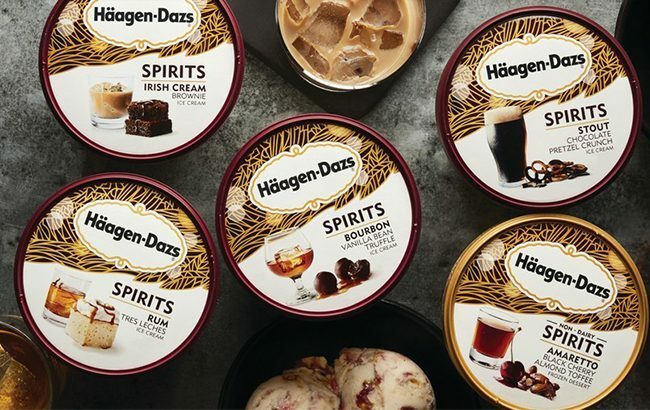 The Häagen-Dazs Spirits Collection will be widely available across the US by April 2019 at an RRP of US$5.29 per product. Each product contains less than 0.5% alcohol. From 1 March, Häagen-Dazs stores will also have select flavours from the new range available in a cup, cone, sundae or milkshake.